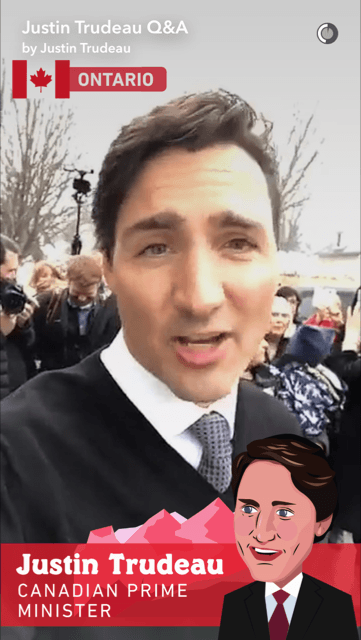 Canadian PM Justin Trudeau is officially the first politician to take part in a Snapchat Live Story (a curated slideshow of images and videos from a specific event). As part of his trip across Ontario on Thursday, Trudeau took to the visual messaging app to host a Q&A session in the style of a town hall meeting. 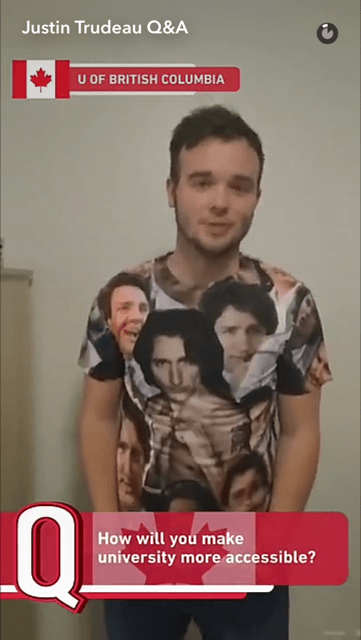 Snapchat’s younger users from university campuses around the country were asked to submit their questions in the form of snaps to the “Trudeau Q&A” story. The Live Story is currently featured in the Discover section of the app, and will be available to users in the United States, Australia, New Zealand, Ireland, and the U.K. until Friday 4 p.m. PT, reports Adweek. The Trudeau Q&A Story generally switches between videos of user-generated questions (on everything from foreign policy to the PM’s hair grooming routine) and Trudeau’s answers. Much like his Twitter feed, Trudeau replies to some of the queries in English and others in French. 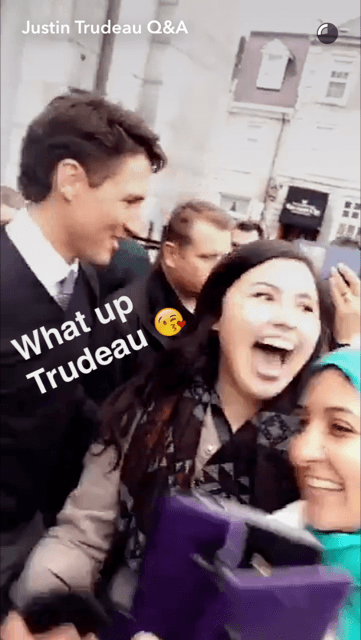 Additional snaps include Trudeau meeting with local citizens during his Ontario tour. Despite hosting similar interviews with celebs such as Selena Gomez and Kevin Hart, Snapchat has not managed to secure politicians to do the same. However, the app did gain ground with presidential candidates Donald Trump and Hillary Clinton during election season, with both using Snapchat’s sponsored features (such as lenses) for promotional purposes. Perhaps we’ll even see a Trump Q&A in the future, or similar Live Stories with other global leaders.